Trump And Kim's Second Nuclear Summit Ends With No Deal Talks between President Trump and North Korean leader Kim Jong Un ended early Thursday. Trump cited continued sanctions against North Korea as a sticking point. President Trump speaks as Secretary of State Mike Pompeo looks on during a news conference following the summit in Hanoi, Vietnam. Trump's second summit with Kim Jong Un collapsed Thursday without an agreement between the two leaders. Unable to come to an agreement, the two leaders decided to end the summit early. "Sometimes you have to walk, and this was just one of those times," Trump said. Trump meets with Kim in Hanoi. No deal was reached. But at around midnight, North Korea's government called a rare news conference of its own in which it refuted key details of Trump's version of events. North Korean Foreign Minister Ri Yong Ho said his government had asked only for a partial lifting of sanctions. In exchange, he said, "We will permanently and completely dismantle all the nuclear material production facilities in the Yongbyon area, including plutonium and uranium." Ri added that international inspectors could verify the dismantlement of Yongbyon. In addition, he said that the North would offer a permanent freeze on nuclear and long-range missile testing. Thursday afternoon Eastern time, the White House said it was aware of North Korea's reaction but did not immediately provide comments on it. The countries have not announced a schedule for when negotiations might resume. Secretary of State Mike Pompeo told reporters aboard his plane "we haven't set a date" for the next working-level meeting. President Trump spoke to South Korean President Moon Jae-in and Japanese Prime Minister Abe during his flight from Hanoi to Anchorage, Alaska, saying the administration would "continue the conversations" with North Korea and coordinate closely with allies, according to White House press secretary Sarah Huckabee Sanders. During his news conference earlier in the day, Trump said he could have signed a deal with North Korea, but neither he nor Pompeo would have been happy with it. "I could have 100 percent signed something today. We actually had papers ready to be signed. But it just wasn't appropriate. I want to do it right. I'd much rather do it right than do it fast." Pompeo said the U.S. had asked Kim to "do more," but he was "unprepared to do that." It's a "very complex problem" that will take time, Pompeo said. They now know what some of the limits and challenges are, and he hopes that they could ultimately achieve denuclearization of the Korean peninsula, which he said is "what the world wants." "I want to take off the sanctions so badly," Trump said, "because I want that country to grow. That country has such potential." Trump said he doesn't want to increase the "strong" sanctions that are already in place because he doesn't want to harm the citizens of North Korea. Trump said they got a better understanding of what Kim thinks of when he says denuclearization. "He has a certain vision, and it's not exactly our vision, but it's a lot closer than it was a year ago," Trump said. "I think eventually we'll get there." I want to do it right. I'd much rather do it right than do it fast. Pompeo echoed Trump's optimism. "We are certainly closer today than we were 36 hours ago, and we were closer then than we were a month or two before that," he said. Also during the press conference, Trump criticized Congress for holding what he called a "fake hearing" with Michael Cohen while Trump was in the middle of a summit with Kim. Cohen called Trump a "racist" and a "con man" and detailed a litany of alleged wrongdoing by the president. Cohen stopped short of alleging coordination with Russia to win the 2016 presidential election — a fact Trump mentioned at the press conference, noting there was "no collusion" with Russia. Trump and Kim "had very good and constructive meetings," press secretary Sanders said in a statement. "The two leaders discussed various ways to advance denuclearization and economic-driven concepts." However, she said, "no agreement was reached at this time." The signing ceremony was called off with less than two hours to go. After the news conference finished, Trump said he was headed back to Washington. 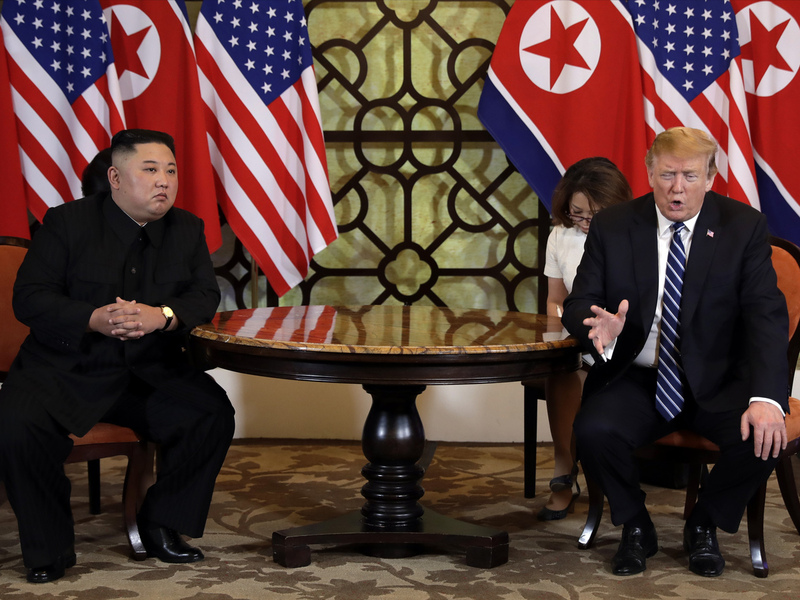 Before the summit, Trump said he had been optimistic that some agreement with North Korea could be reached, even if it didn't lead to immediate plans for denuclearization. 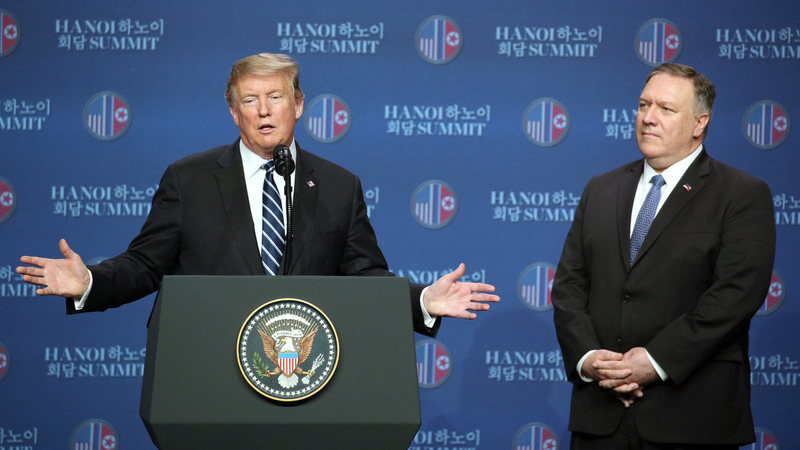 According to The Hill, the "lack of any tangible results is sure to give fodder to critics who have accused Trump of holding summits with Kim that are nothing more than photo [ops] that boosts the legitimacy of the North Korean dictator." The Washington Post called the turn of events "a diplomatic failure." Earlier, the two leaders had expressed optimism about reaching a deal over nuclear arms. Asked by a reporter if he was willing to "denuclearize," Kim said, "If I'm not willing to do that, I wouldn't be here right now." NPR's Seoul correspondent Anthony Kuhn says South Korea was caught off guard by the collapse of the talks, as President Moon was prepared to deliver a speech on burgeoning peace on the Korean Peninsula. Stock markets in South Korea and Vietnam also plunged on the failure of the summit to reach an agreement.